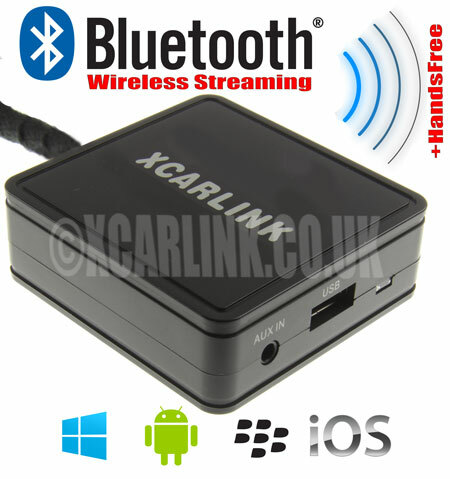 The new Xcarlink Bluetooth Interface enables you to stream music from any smartphone, mobile device or tablet to your original factory fitted car radio/navigation system, while at the same time providing you with a Bluetooth handsfree solution. 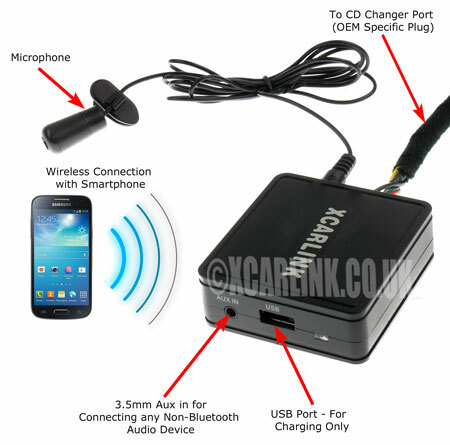 One of the major benefits of the Xcarlink Bluetooth interface is that it also incorporates AVRCP technology which also allows you to control your music via your radio or steering wheel controls. It is compatible with all popular mobile devices and Smartphones including Android, Windows mobile, Apple OS, Blackberry etc and is ready to use as soon as you enter your vehicle - no need to connect any cables to your device (except if charging is required ). Connect any Smartphone including Android, Apple, Windows and Blackberry and stream music wirelessly with to your original factory fitted car radio/navigation system. Control your music using your radio or steering wheel buttons i.e. Change track, fast forward, rewind, volume etc. Direct CD changer port connection involving no FM Modulation for high quality sound without interference. Plug and play installation - retains original equipment with the interface hidden away from view. Answer/Reject calls though your original car radio/navigation system via the FF (Fast forward) button. Supports music streaming via A2DP Bluetooth and control via AVRCP. USB charging port to keep your device charged when used with an optional USB charging cable. Automatic pause when switching to CD/TAPE/FM etc. 3.5mm AUX input for connecting non Bluetooth devices. 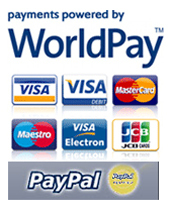 Works with apps such as Spotify, Google Play etc including control. The interface connects to the CD changer port located on the back of your car stereo. On some cars, this can be reached from the passenger side whilst on others you will need to remove the radio. Instructions how to remove your radio to access the CD changer port can be found through many online resources, car manuals or by a local installer. The interface is compatible with any Bluetooth enabled device including Andriod, Blackberry, Windows, iOS mobile phones and tablets. 3.5mm AUX cable - The AUX cable allows you to connect any audio device to the Xcarlink such as an MP3 player, iPod shuffle, Satnav Audio out etc. Ideal for connecting Non-Bluetooth enabled devices. Micro USB charging cable - Charge any device which that has a standard Micro USB charging port such as Samsung Galaxy, Blackberry, HTC etc. iPod/iPhone 8 pin (lighting) to USB cable – For charging of newer Apple devices with the 8 pin (lightning) dock connection. i.e. iPhone 5/5S/5C, Touch 5G, iPad 4, iPad Air etc.